It's Thursday morning, which can only mean one thing.....only one more sleep 'til Friday! I am looking forward to Saturday so I can finally embrace the Christmas feeling, as I'm very against festive frolics in November. Last night I had a burst of energy and flash of guilt when I saw the cookie cutters I had bought from Decobake a couple of weeks ago which I had yet to use. 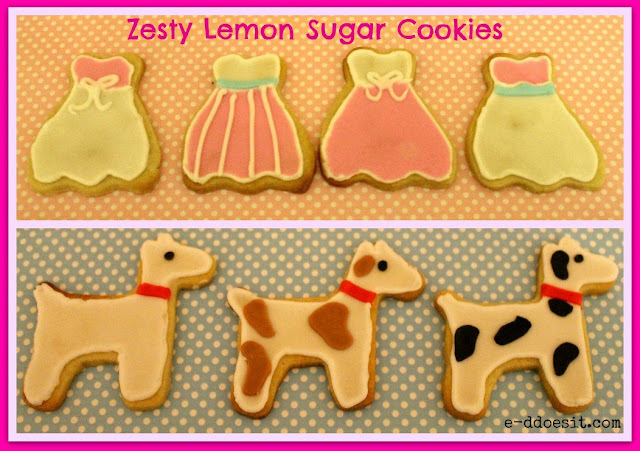 I fled to the kitchen to get going on some pretty sugar cookies with a lemon twist. I couldn't decide which cutters to go with first so ended up doing a random mix of pretty dresses, colourful cakes and beautiful dogs. Put the butter, sugar and lemon zest in a free-standing electric mixer and cream until light and fluffy (You can also use a handheld whisk). Add the egg and mix well and lemon juice, scraping the sides of the bowl intermittently to ensure all the ingredients are incorporated well. Add the flour and salt, mixing well. The dough should look light, feel soft and be easy to handle. Dust a clean surface with flour and roll out the dough using a rolling pin. 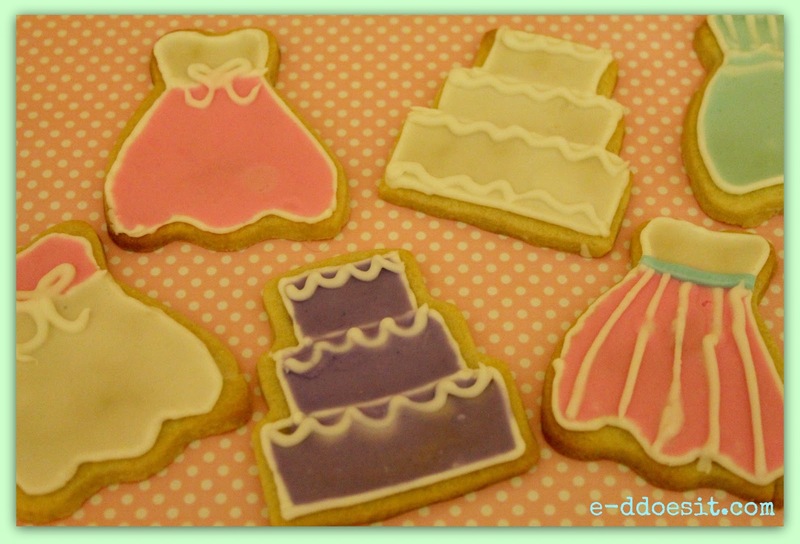 Cut out the shapes of your choice (on this occassion; dogs, dresses and cakes!) . Place the cookies on a well greased or lined baking tray (you will need at least two large trays) and bake for 10 minutes at 170C. The cookies should be very light golden on the outer edges and paler in the centre. 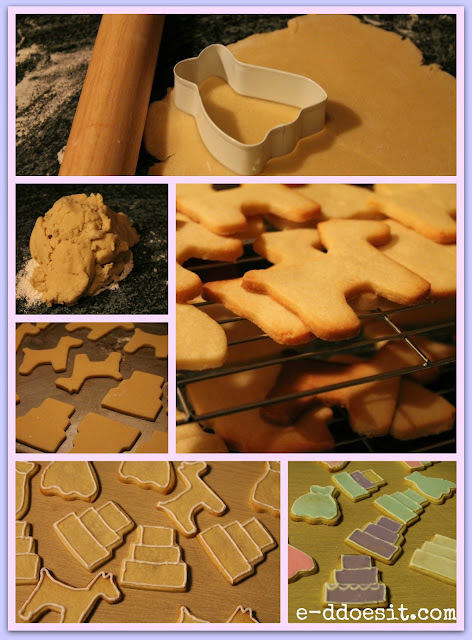 Once cooked remove the cookies from the oven and place on a wire rack to cool. - royal icing (colours of your choice). 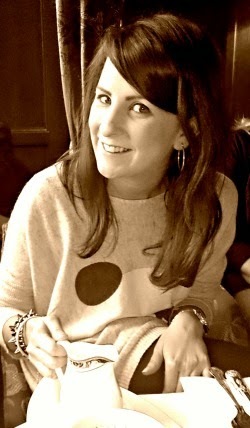 venture better done at the weekend when you have ample time. 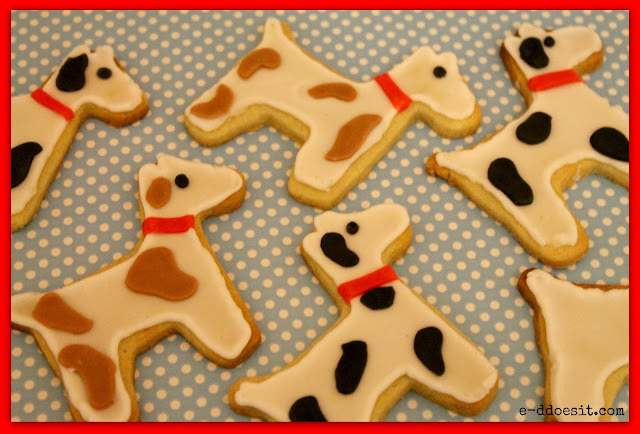 you made some of thos ebiscuits fr my dad,s first aid course so he gave me one and they were de-lish !!!!!!!!! I'm glad you liked them....and hope you liked the cake too!!! I'd imagine so, I've never tried it with this dough, but it works well with other doughs so I'd defo try it out. The icing is very time consuming alright! Ideally a lazy Sunday afternoon when your not under pressure is the perfect time for these ones!